The DRD (Drag Reduction Device) is quite self-explanatory: a device that aims to reduce drag. It is not a new idea on the F1 scene (Lotus have been testing it on track since early last season) but it is extremely difficult to implement. This post aims to highlight what DRD is, how effective it is and why it has been difficult, so far, to produce a race-ready system. As I mentioned above, the whole concept of it is to reduce drag at the rear wing of the car. Reducing drag results in a greater top speed, which could prove to be even more valuable this season as DRS (Drag Reduction System) is limited to designated zones of each track during practice and qualifying, as the driver has no longer free usage of the system over the entire lap. The greater straight-line speed that the device induces should correlate to a better overall laptime, particularly on circuits with longer straights. DRD is a passive system, which basically means that the driver has no control as to when it is active or not. The idea of the device is that it activates/deactivates at a select speed, reducing the drag of the car after this speed but also switching off under braking so downforce is regained when the car is slowing down. More on this later. It is quite complicated to explain, so I shall do my best! There are a few parts to this device: the inlets, the Y75 (monkey seat) outlet and the drag reduction outlet. I will start with the inlets. 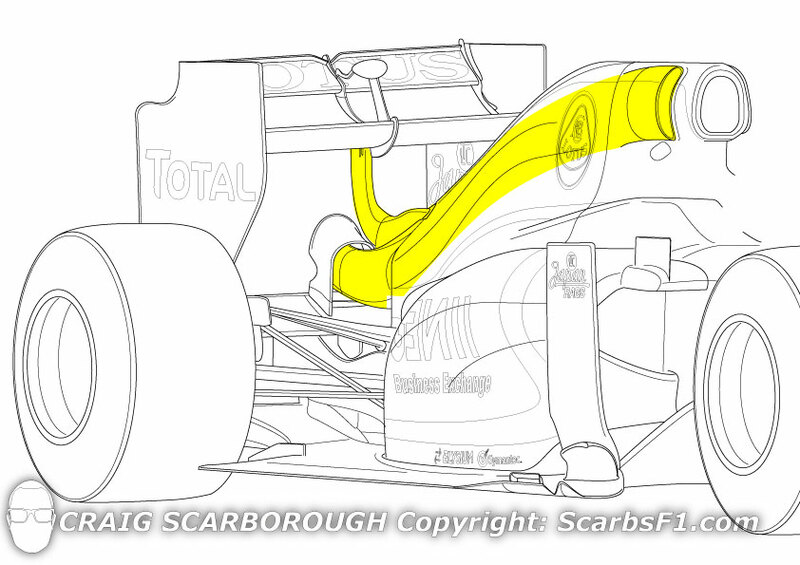 On the Lotus system, the inlets for the device on either side of the airbox. There is very highspeed airflow here, as it is relatively undisturbed by the front of the car, which is exactly the kind of flow needed to make the system work. The inlets allow airflow to pass through them just like the airbox does, but it channels it differently. The airbox allows airflow to pass into the engine, whilst the inlets have two tasks – to cool the gearbox and also provide the air to stall the rear wing when the device becomes active. The inlets then file the airflow along and down the engine cover before reaching the Y75 outlet. At slower speeds, the airflow will simply pass through the inlets, cooling the gearbox as it travels through, before passing out of this outlet to extract the hot air. The Y75 winglet (at the centre of the beam wing) is designed around this outlet, creating a rounded appearance to it and hence picking up its more recognised name, the Monkey Seat! However, once the car has surpassed a specific speed, the airflow coming in through the inlets then pass up the central shaft beneath the rear wing. This air then exits via small holes, splaying across the underside of the wing perpendicular to the angle of airflow coming over the wing itself. This cross-angular airflow creates a fair amount of turbulence, causing a small section of the main plane to stall. This stalling effect reduces the drag of the wing and increases the top speed. It continues to stall the wing above the specific speed it has been set, before the airflow passing through the inlets is diverted back through the Y75 outlet once dipping under this speed, inducing downforce along the main plane of the rear wing to aid braking and cornering. To really see how this is working, here is an image of the Lotus system with flo-viz across the entire rear wing of the car. At the very centre of the rear wing (right above the centre shaft), we can see a darker V-shaped region at which the air from the shaft has splayed out the flo-viz during the stalling phase. This section is the part of the wing that is stalled to reduce drag. It is not a large area, but it is sufficient to gain a few miles per hour. Why is it difficult to implement? The concept of it is simple: at high speed, blow airflow across the rear wing to create turbulence and lower the drag. But that is where the simplicity stops! This device is NOT like the F-Duct of 2010 in that it is not a fluid switch – airflow cannot be manually diverted by the driver to change another airflow’s path along the car. This is against the rules! The device can only become active at a certain speed; which brings me onto my next point. Different circuits require different aerodynamic characteristics from the car. Take Monza as an example, the highest average speed over a single lap is obtained here than any other track on the calendar. This means that the car is set up for very high speeds, requiring a low downforce configuration. The total opposite of this would be Monaco – get as much downforce on the car as you can regardless of the drag it induces! In between the two is somewhere like Spa – a fast circuit, but the corners themselves are highspeed, requiring the best compromise of low downforce and highspeed grip. This is where it gets very tricky for engineers. At Monza, engineers will want the device to start stalling the wing at a lower speed as the corners are relatively lower speeds in comparison to what the top speeds are along the straights. However, at tracks like Monaco, it isn’t really worth having at all as the cars rarely reach above 175mph. Where it really is a headache for the teams is at places like Spa, which demand good top speed for the Kemmel and back straights yet also require the extremely highspeed cornering speeds to generate a good laptime. You don’t want the device suddenly activating midway through a highspeed turn because you’ve set it up to start stalling at too low-a-speed! It poses quite a serious safety threat to the driver, which is also why teams are struggling whether to really develop upon the idea. Not only that, but actually getting it to stall at a specific speed is difficult within itself which is why no team is yet to run the system in a qualifying or race despite development starting about a year ago. Will it ever be raced? I think that teams will start finding solutions soon. In Jerez last week, Mercedes were testing a Lotus-style system and Lotus were testing a Mercedes’ original device! This shows that they are trying hard to implement the device as the engineers predict that it might be worth a few tenths per lap, fluctuating depending on the type of circuit. Hopefully we will see one being raced sooner or later this season, which will probably mean that everyone else will follow suit! I mentioned that Lotus and Mercedes have seemingly “swapped” systems (the shaft on the 2012 Lotus system originally attached to the rear wing, the 2012 Mercedes shaft was just beneath it), but there have been some other designs, most interestingly the Toro Rosso setup at the YDT (Young Driver Test) in Abu Dhabi last year, which utilises two shafts with the Y75 winglet attached in between them. Red Bull and Sauber have tested their own devices at the YDT, but both are yet to run one at this year’s testing. I hope I explained it well enough for you to understand! Feedback would be great as I am learning all of the time. Thanks for reading! This entry was posted in Analysis, General on February 12, 2013 by thewptformula. Very interesting article (I’ve been wondering how this was supposed to work since Lotus started testing it in practice something like 8 months ago). Presumably it will be of no use in Singapore and perhaps Valencia, as well as Monaco? Whilst there does seem to be an advantage on offer, given it’s taken so long I would’ve thought the same time or more could’ve been had by development in other areas. Tried to make it understandable, it is quite a complex device in terms of adjusting it to suit different tracks. I think it will be extremely beneficial in Valencia: it requires a lot of downforce as it is, effectively, a street circuit, but there are two very long straights in the middle sector. The system will be very useful at this kind of circuit because teams will be able to add more downforce to the car without compromising their middle sector pace, as the DRD will increase their top speed anyway. At circuits like Monaco and Singapore then it has no real benefit as you say. I see where you’re coming from and I would have agreed with you a year or so ago. However, teams are running out of ideas as the regulations are very stable for this season, so I believe that it is worth the investment. It’s getting harder for designers to apply more downforce, so why not concentrate on reducing drag? Lotus have adopted this approach for this year, as they have worked a lot on the internals and finer details to reduce drag as much as possible. The little gains will all add up to make a big gain! Ah, I’d forgotten about the quick bits in Valencia. Incidentally, what precisely does ‘stalling’ the rear wing mean? That’s a fair point on regulation. I wonder if those not competing at the sharp end will prefer to develop their 2014 to maximum potential. It’ll be interesting to see how Mercedes, in particular, end up doing this year and next. This isn’t the best explanation, but stalling is when there is no longer clean airflow travelling over the wing surface, therefore the wing cannot function as it is intended to. The cross directional airflow between the stalling shaft the the oncoming airflow underneath the rear wing causes a small section of the wing to stall, meaning that it is stopping it from producing downforce, therefore decreasing drag. I expect many teams to focus on next year except for those fighting for the championship. Having said that, there will probably be a 50/50 split in the technical department for most teams already for next year. I enjoyed reading the article. I could understand it easily. Every day I’m more interested in these kind of topics related to the development race in F1.